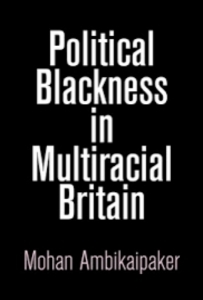 Political Blackness in Multiracial Britain. Mohan Ambikaipaker. University of Pennsylvania Press. 2018. In 2009, more than ten years after Stephen Lawrence’s horrific racially motivated murder in London, his assailants were finally convicted. This led Trevor Phillips, then head of the Commission for Racial Equality, to proclaim the end of institutional racism in the London Metropolitan Police Service, declaring Britain to be ‘by far the best place in Europe to live if you are non-white’. Such a nationalist narrative, however, masks the fact that despite the passing of purported race-blind liberal policies and laws (e.g. the Race Relations Acts and the 2006 Racial and Religious Hatred Act), the black community in Britain still experiences everyday racist violence from white British society, and is not protected by institutions such as the police and the courts. How do we understand the relationship between sustained institutional racism and the everyday violence experienced by the black community in Britain over time? To theorise this in Political Blackness in Multiracial Britain, Mohan Ambikaipaker reflects on his experience as an unpaid caseworker (2005–06) and longtime associate of the Newham Monitoring Project (NMP), fighting against the failure of the British liberal state to provide justice to victims of racism. NMP is a 34-year-old black community-based organisation in East London that is firmly committed to achieving racial justice. Ambikaipaker’s work provides a thick description of the seemingly permanent disjuncture between official anti-racist policies and the actual workings of the British state in responding to the claims of the black community. The reason I found this book so powerful was in large part due to Ambikaipaker’s choice of methodology. He refuses to be a disengaged observer, but instead opts for an ‘activist anthropology’ approach with NMP. He does this because he recognises in his book that conducting interviews with the police force would privilege the performance of white informants in adjudicating whether or not institutional racism is real. Instead, he chooses to work with NMP, an organisation firmly committed to a racial analysis of British liberal governance, informed not only by local and national events in Britain but also black consciousness movements around the world. By doing so, he is able to tell a story that weaves cultural, structural and political analyses together to describe the imbrication of black resistance, hate crimes perpetrated by white society and institutional racism that transcends classifying incidents as aberrational/episodic. Another reason he opts not to undertake a traditional ethnography is because he himself is non-white and a Commonwealth citizen whose own life had been shaped by colonial racial policies. He thus did not come to this study as a ‘traditional white male anthropologist’ conducting participant observations in an exotic location, but rather had to struggle with the British state and its antipathy to non-white immigration. Ambikaipaker was drawn to the borough of Newham for his research because of its dynamic, cosmopolitan nature and its diversity: although the white British population was the majority in 2006, there was a large population of multiple black communities living side-by-side in the borough. NMP had a strong presence in the neighbourhood. It followed two main strategies for bringing about justice: casework, where activists helped individual members of the black community in Newham to obtain justice for the wrongs they had suffered from racist violence and police abuse; and campaigns for justice in high-profile cases of police abuse and racial attacks. Ambikaipaker’s book thus contains the stories of people he helped directly as a caseworker. These include Amina, a single mother of Indian descent (Chapter Two); Gillian, an African Caribbean woman (Chapter Three); multiple British Muslim women in Newham (Chapter Four); British-Bangladeshi Muslims; stories of victims in high-profile cases such as that of Abdul Kahar and Abul Koyair and their families who were wrongly targeted as terrorists by the British police (Chapter Five); and the life stories/motivations of NMP activists themselves. Each of Ambikaipaker’s chapters starts by situating the ensuing stories he tells in a critical race theory/postcolonial framework. A note here about Ambikaipaker’s use of ‘blackness’. Although Ambikaipaker refers to all non-white communities as ‘black’, he does so in a political sense, not a cultural one. He explains at length why he does so in Chapters Six and Seven of his book: he does not essentialise blackness, but instead shows that although the experience of black communities is different, they are all victims of the racial hierarchy in Britain. NMP thus uses political blackness as a rallying strategy to build solidarity between communities to create a ‘mosaic of unities’ to fight injustice together. The structure of Ambikaipaker’s book is analogous, comprising a mosaic of stories, reflections and anecdotes from members of diverse black communities, which stress the differences in their experiences, while on a larger scale pointing out the connections. For example, in Chapter Two detailing Amina’s harassment and quest for justice, Ambikaipaker shows how white solidarity in everyday life universalises whiteness at the expense of blackness. He shows how white police officers, white society, white judges and even white defence lawyers tend to stick together and believe each other. He shows how this results in the dismissal of the claims of the black community regarding racial harassment. However, he goes beyond this and situates these actions in the state’s outsourcing of more and more social services to private contractors. These structural factors affect all black communities. I would have loved to see a more detailed history of the stages of evolution of institutional racism, as Ambikaipaker mainly focuses on structural discrimination in the 2000s. In his chapter detailing how police abuse had torn Gillian’s life apart, Ambikaipaker focuses on the effects on women specifically, revealing the intersectional contours of racial violence suffered by the black community in Britain. And in his chapter on the Muslim community in Britain, Ambikaipaker shows the evolution of the state’s approach to ‘managing’ the black community. He details how the language of multiculturalism and community cohesion, which have obscured the true root of racism in the British state, have been replaced by the coded language of counter-terrorism, which has served to particularly target the Muslim community. By doing so, he shines a light on the unchanged racist intentions of the state and its evolution in form. Ambikaipaker recognises the intense debates that have alternately valourised and critiqued political blackness by academics such as Paul Gilroy, Julia Sudbury and Tariq Modood. Moreover, he shows how naturalised representations of race relations in the United States have resulted in ideas of ‘political blackness’ in Britain often being dismissed as ‘inauthentic’. Nevertheless, he argues it is key to understanding the strategy employed by NMP to catalyse solidarity between different religious and ethnic communities in the fight against racial violence. He relays the reflections of Cilius Victor, an NMP activist involved with the organisation between the 1980s to the 2010s, who had witnessed the iterative composition and recomposition of political blackness in anti-racist struggles in Britain. He also provides concrete instances of where different black communities have shown up for each other in Newham: for example, multiple communities came out on the streets during the Newham 7 and Justice for Pryce campaigns in the 1980s. He also gives a few examples of where the idea of political blackness has spilled over from local activism into art, encapsulated in music videos and radio broadcasts, among other examples. Nonetheless, I have a few concerns about Ambikaipaker’s argument about the lived reality of political blackness. For one: in the introduction of the book, he shows how some members of the black community in Newham have absorbed the racist logic of the state and heeded the cultural tropes of blackness the state has kept alive. Such tropes reify different black communities, accentuate their differences and downplay their common experiences and connections. I therefore would have loved to have seen more of a theoretical engagement with catalysing moments of political blackness, and how exactly NMP turned this idea into reality. I would also have loved to see a thicker description of how the strategy of political blackness has evolved over time. Finally, Ambikaipaker shows how the surge of the counter-terrorism industry and the state’s pathologisation of the Muslim community are no different, and indeed builds on earlier targeted violence against Afro-Caribbean, African and South Asian communities. However, in this new iteration of state racism, the state has reallocated funding from community organisations and social welfare services to that of surveillance. Because of this, NMP lost major streams of funding and was disbanded in late 2015. The new forms of resistance that political blackness will take in the coming years are yet to be seen. In this regard, Ambikaipaker argues that NMP’s approach and its stories will remain an important archive for future activists. Mohan Ambikaipaker has written an important book that foregrounds the experience of the black community in Britain fighting for racial justice, while caught between the racist violence of white British society and institutional discrimination. Political Blackness in Multiracial Britain makes it impossible to explain away such experiences as individual or episodic. It provides a rich theory to shine a light on the roots of racism that are in permanent contradiction with the stated aims of British liberal governance. Finally, it provides a new angle on the strategy of political blackness employed by NMP in anti-racist campaigns that is generative of potential ways that solidarity between different black British communities can be forged in the future. Priyanka deSouza is a PhD candidate in the Department of Urban Studies and Planning at the Massachusetts Institute of Technology. Read more by Priyanka deSouza.